The Nigerian military has been accused of killing hundreds, maybe thousands, of civilians in the oil-rich Niger Delta. The military offensive began eight days ago but has received little international attention. We go to Nigeria to speak with Denzil Amagbe Kentebe of the Ijaw National Congress. We're also joined by Sandy Cioffi, director of the new documentary Sweet Crude about the Niger Delta. The village of Oporoza, where much of the film was shot, has just been burned down. Denzil Amagbe Kentebe, chair of the Ijaw National Congress (INC), Lagos Chapter. Sandy Cioffi, director of the new film “Sweet Crude.” During the making of the film, Sandy and her crew were detained by the Nigerian military and held for seven days. JUAN GONZALEZ: We turn now to Nigeria, where the Nigerian military continues to carry out attacks by land, air and sea on the oil-rich Niger Delta. Reports indicate hundreds, possibly thousands, of Nigerian civilians may be dead. Entire villages have reportedly been burned to the ground. The military offensive began eight days ago but has received little international attention. Aid groups and journalists have been blocked from entering the remote region, which is accessible only by boat. On Wednesday, a coalition of environmental and human rights groups called on the International Criminal Court to launch an immediate investigation into the killings. 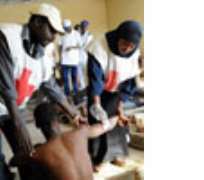 The Nigerian military has claimed the attacks have only targeted militant camps as part of a peace-keeping effort. AMY GOODMAN: For years, activist groups in the Niger Delta have advocated for fair distribution of oil wealth to local communities in the impoverished region. Last week, one of the main militant groups in the Niger Delta, the Movement for the Emancipation of the Niger Delta, known as MEND, declared an oil war and threatened all international industry vessels that approach the region. Eighty percent of the oil extraction in Nigeria is in the Niger Delta. Major oil firms in the area include Shell and Chevron. We're joined right now by Denzil Amagbe Kentebe. He's on the phone from Nigeria, chair of the Ijaw National Congress, Lagos chapter. He is from Bayelsa State, the site of the ongoing military attacks. We welcome you to Democracy Now! Can you describe what is happening at this point? DENZIL AMAGBE KENTEBE: Well, what has happened at this point is that there's a lot of criminal, unjustified and inconsiderate, callous action, which tends to be genocidal, by the Nigerian military on the people of the Niger Delta region. Women and children have been displaced. The military is saying they are restricting their actions only to the militant camps, that civilians do not live in the militant camps. And we have thousands and thousands and thousands of people being displaced, being killed, and no one is allowed to go into the war zone, because this is a war. And this is genocidal, as I have said earlier on. JUAN GONZALEZ: And, Denzil, what has been the reason that the government has given for this offensive? DENZIL AMAGBE KENTEBE: Well, the government doesn't really have any reason. They are claiming that the militants have been disrupting the oil flow. And what the citizens of the Niger Delta region are claiming is that 80 percent of the oil, of the crude oil, that flows from the country comes from this region. But there is no development. There is no potable drinkable water. There is no infrastructure in place. And so, these people are demanding that, you know, you should do something in this area. That is a crime of the people that have been killed by the Nigerian military. AMY GOODMAN: Describe exactly what the actions are, what communities are under siege right now. And what are the numbers you understand of people who have been killed? DENZIL AMAGBE KENTEBE: Well, people that have been killed, as of the last count yesterday, we have almost 500 people, civilians, men and women, children, dead. Yesterday, a woman and a little boy were shot dead in the city of Warri, which is far away from any of the militant camps. The burning and destruction is completely going on in Okerenkoko, Oporoza, Kunukunuama, Kurutie and many other places around the Niger Delta region, especially in the Delta State area. JUAN GONZALEZ: What about human rights groups? Have they been allowed at all, or international aid organizations, to enter the region? DENZIL AMAGBE KENTEBE: No, when this started about nine days ago, we foresaw what was a deliberate, calculated attempt to destroy the people of this region for their oil. And we immediately called on the United Nations and all international agencies to come to our aid. So far, no one has been in here, no one has called, and no one is even allowed in the area, even the local press. The military is saying they are not destroying, but they have no evidence to prove otherwise. We have gotten information from the citizens that have been displaced. Thousands and thousands of people are living in the forest, as we speak. Without access to any kind of food, water, clothing, they're living in the big forest, as we speak, children inclusive. AMY GOODMAN: And what has been the reaction right now? What is the Nigerian government saying? AMY GOODMAN: We're going to go to break, then come back to this story. Denzil Amagbe Kentebe, chair of the Ijaw National Congress, the Lagos chapter, is speaking to us from Nigeria.